Originally Published in Your Smithfield Magazine, January 2011. It was a battle for which there were no clear winners. What began as a labor issue at Esmond Mills developed into a strike, which later escalated to violence in the streets. When it was over, at least a dozen people had been injured, private property had been destroyed, and one man had taken his own life. This is one of the darker chapters of Smithfield’s past – the story of the Esmond labor strike of 1913. Labor issues were common in the early 20th Century, for it was a time of union organizers vs. corporate management, and both sides saw themselves as being in the right. It was also a time when the textile industry was booming in Rhode Island, and manufacturers were reaping huge profits. There were several issues that led to the strike at Esmond Mills, but the most important was money. Union officials from the Industrial Workers of the World, (I.W.W.) were demanding a twenty percent pay increase for all employees, which mill management saw as outrageous, and counter-offered considerably less. When no agreement could be reached a strike was declared on January 10, 1913. Going on strike was a risky proposition, for many workers lived in mill owned housing, and only as long as the mill employed them. They also faced the possibility of being “black balled” from getting employment elsewhere. Striking also meant no paycheck for food and other necessities. Furthermore, there were always those looking for work that had no qualms about crossing a picket line. Therefore, one could easily find themselves in worse circumstances than before the strike. Since the mill was the largest employer in Esmond, local businesses relied on workers willing to spend their paychecks, but since workers now had no money to spend, some merchants suffered. The first casualty of the strike was a financially strapped Georgiaville butcher who reportedly took his own life due to the loss of revenue created by the situation. On the morning of January 20th he was found dead in his shop from a self-inflected gunshot wound. The unfortunate man left a wife and three children. On that same day, the mill superintendent announced that the mill would remain closed “ten years or twenty years” rather than give in to the union’s demands. Despite this prediction, the mill reopened just five days later after hiring new workers. It was also on that same day that one-hundred workers from the Allendale Mill in nearby Greystone walked out of their jobs in support of those in Esmond. In the meantime, negotiations were taking place with both sides holding firm. Union meetings were held in the Graystone fire station, where some workers expressed a desire to return to their jobs while they still could, while others opted to remain on strike. Union leaders beseeched members to stand together in solidarity, but many of the men had more than just themselves to consider; they had families to feed. By February 1, the union opened a soup kitchen at the fire station, but by then many had already returned to their jobs. In response to this, union officials tried to encourage the remaining strikers by claiming their ranks were growing every day, but the men could see for themselves that such was not the case. The union made the same assertions to the press, but mill management told reporters that some men would return to their jobs in the morning only to walk out again afterward while trying to induce others to follow. The union, they stated, was claiming these same men as new recruits. Tensions grew, and deputy sheriffs were brought in to assist local police in preventing strikers from harassing those who crossed the picket line. This led some to change their tactics. Since many newly hired workers were from outside the village, they would commute via the trolley line that once ran along Waterman Avenue. On February 5, large stones from a cemetery wall were placed across the trolley tracks, and when the trolley came to a stop it was attacked by thugs who broke the windows and injured some of those aboard. Others in the group attempted to cut telephone lines, presumably to prevent calls for assistance by police. The riotous incident had a sobering effect on mill management who agreed to some concessions two days later. Those concessions included an advance in wages since many were without money, no rent increase in company housing, and time and a quarter for overtime. The strike was now four weeks old, and both sides were suffering financially, yet despite concessions, both sides stood firm on their position over the proposed twenty percent wage increase. It now came down to who would blink first. The union boasted that it had plenty of funds to pay strikers while they were out of work, (Although there was evidence to the contrary.) and mill management claimed to be running at two-thirds capacity while union officials put the figure closer to ten percent. In spite of the wage obstacle, newspapers reported that the strike was “nearly ended”. The papers had to retract those words four days later when violence once again erupted along Waterman Avenue. On February 11, several gunshots were fired at a trolley car filled with workers as it made its way from the mill towards North Providence. The shots were followed by a hail of rocks which shattered the car’s windows. Remarkably, only one person was injured, and fortunately not seriously, but the conveyance suffered considerable damage. Problems also arose outside the mill where strikers sparred with police, harassed female employees, and tried using use force in keeping workers out. Four Smithfield men were arrested that day on various charges, including assault. Mill villages such as Esmond were generally quiet communities consisting of hard-working, God-fearing people, where violent labor disputes such as the one being experienced were unknown. After the second horrifying attack on a trolley, one striker told a reporter that most of them were ready to return to work if the mill management would make an offer that was fair to both sides. Wages were still the sticking point, but it was obvious that some compromise had to be reached, for the mill needed workers to make a profit, and workers needed the mill to make a living. As the saying goes, a house divided cannot stand. A settlement was reached on February 17th, where it was agreed that workers would receive a pay increase from five to fifteen percent based on the skill level their individual job required. It was also agreed that the Industrial Workers of the World Union would no longer be recognized as a bargaining agent. The Esmond labor strike was only one example of what was taking place all across the country at that time as union men in every industry sought to organize. In many ways, what happened in Esmond was mild by comparison. 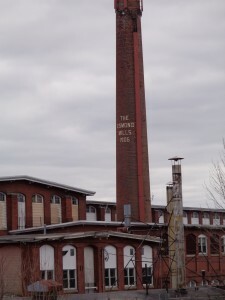 Those employed at Esmond Mills eventually joined another union as unions continued to grow in power and influence, but it was this same power and influence that eventually caused mills throughout New England to close their doors and relocate to the southern states where unions were virtually non-existent. In 1948, Esmond Mills was sold, and the new owners moved all textile manufacturing operations to Georgia. Afterward, the nearly 1,100 ex-workers applied for severance pay as stipulated under their union contract, but the applications were denied. The Textile Workers Union of America, which represented the workers at that time, brought the matter before the United States Mediation and Conciliation Service which subsequently ruled against the former employees. This decision cost the ex-workers an estimated $870.000. 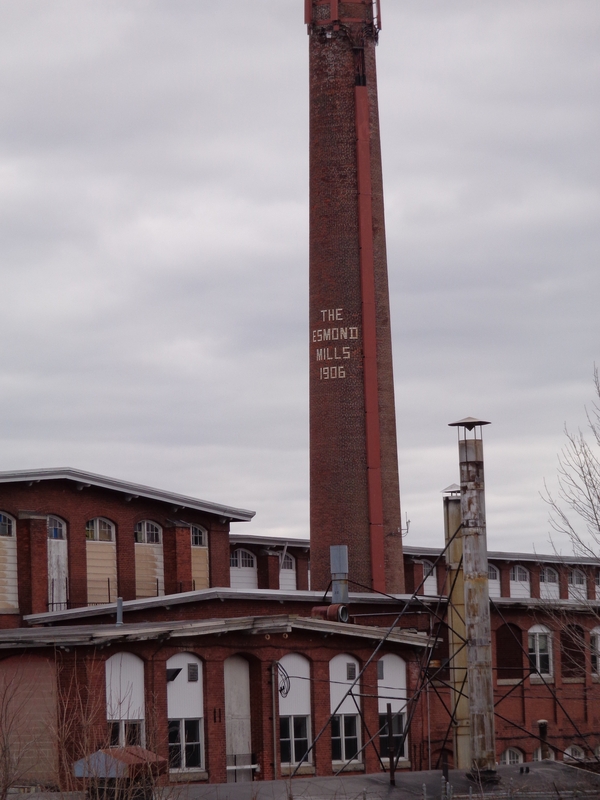 Today, the old Esmond Mills stands as a brick monument to a bygone era. The building where hundreds of workers once made their living now serves as a warehouse.